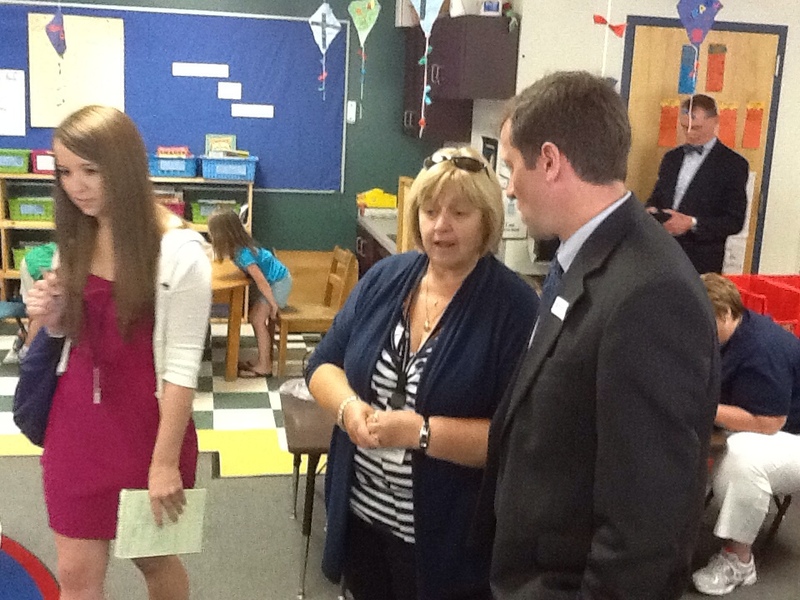 This morning, Maine Education Commissioner Steve Bowen spent an hour at Auburn’s Fairview Elementary School. We had been wanting Commissioner Bowen to see how Auburn’s schools are leveraging technology for learning. Although the brevity of his visit precluded having him go to the middle school or the high school, we did get him to one of our elementary schools. The Commissioner was able to visit Kelly McCarthy’s kindergarten classroom to experience Advantage 2014, our literacy and math program with iPads. Next, he visited Stephanie Marris’s 6th grade to see project-based learning with laptops in action (in this case, working on filming and editing plays students were creating and performing). The Auburn team had three key messages for Commissioner Bowen about teaching and learning with technology. Teachers are used to being the experts and passing their knowledge on to students. This sometimes leads to teachers feeling uncomfortable when they aren’t the expert. In many cases, however, students are more comfortable with technology than their teachers are. Teachers need to get out of the way of their students when it comes to technology. They need to see what the students can teach them, and allow students to pursue ways to use the technology for learning that the teachers themselves might not know how to do. This can be especially true for teachers in grade levels starting an initiative while inheriting students who have already been in it for a year or more (as it was for 8th grade teachers in the second year of MLTI a decade ago, and will be for Auburn’s 1st Grade teachers this coming year). When teachers are intentional in their planning, and are selecting apps and activities that both match the curriculum and engage students, the students can be more self directed, receive more immediate feedback, and spend more time on task. This allows teachers to give more students individualized attention, as well as give each student what they need academically when they need it. More teaching gets done! Successfully leveraging technology for learning doesn’t just happen. Kids don’t learn better just because we passed out laptops or tables. It takes planning, and team work, and communication, and positive pressure and support, and lots and lots of PD and support for teachers. It takes leadership with school change in mind. This entry was posted in Advantage2014 - Auburn iPads, Technology for Learning and tagged Auburn, Commissioner Bowen on June 1, 2012 by Mike Muir.